Authorities in Bangladesh kicked off on Sunday an immunization campaign among Muslim Rohingya refugees as an aid group warned that many could die due to a lack of food, shelter and water. The campaign started in a crowded border camp as the country struggled to take in more than 400,000 Rohingya, who have fled Myanmar in the last three weeks where they were victims of a government crackdown. The UN has since described the crisis as ethnic cleansing. Bangladesh Prime Minister Sheikh Hasina, who lambasted Myanmar for “atrocities” during a visit to border camps last week, left Dhaka to address the annual UN gathering in New York. Abdus Salam, the top government administrator in the Cox’s Bazar district hospital, said that some 150,000 children will be immunized over seven days for measles, rubella and polio. UN says there are some 240,000 children living in dire conditions. On the first day of the immunization campaign on Saturday, doctors treated some 9,000 children for rubella and nearly 5,000 for polio. Salam said that basic and emergency health services were being provided through 36 medical camps with focus on children and women. “Many of them are suffering from diarrhea, dehydration and skin diseases. They are coming to hospitals with such complications,” he said. As the weather fluctuates in Cox’s Bazar between rains and sunny and humid days, many children are suffering from flu and risk pneumonia, he said. Two preexisting Rohingya camps were already beyond capacity and the new arrivals were staying in schools or huddling in makeshift settlements with no toilets along roadsides and in open fields. The refugees began pouring from Myanmar’s Rakhine state after a Rohingya insurgent group launched attacks on security posts August 25, prompting Myanmar’s military to launch “clearance operations” to root out the rebels. Those fleeing have described indiscriminate attacks by security forces and Buddhist mobs. The Myanmar government says hundreds have died, mostly “terrorists,” and that 176 out of 471 Rohingya villages have been abandoned. Myanmar has insisted that Rohingya insurgents and fleeing villagers themselves are destroying own homes. It has offered no proof to back these charges. “Why did they shoot him? What’s his crime? He is just a child,” Rahmatullah said. “It was 9 in the morning and I was visiting my neighbor’s home at my Baagguna village when they came and started shooting indiscriminately.” He said he fled with 10 of his family members. “I started running for the hill, where I hid myself and later collected my son and others and left,” he said. 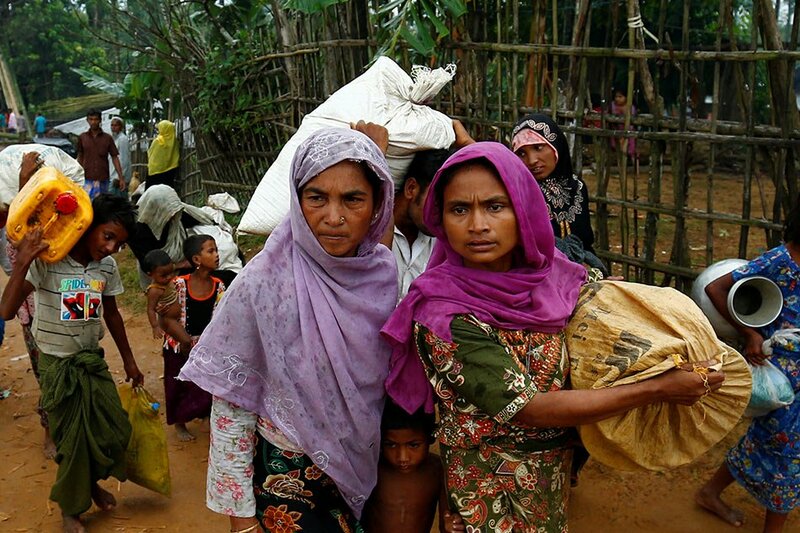 Eric P. Schwartz, head of the US-based charity Refugees International and a former assistant secretary of state for population, refugees and migration, said he couldn’t recall seeing so much misery in the camps and called for international pressure on Myanmar to stop the violence. He said the US should re-impose sanctions on Myanmar that were in place before it made transition from military to civilian rule. But officials in Washington have been careful not to undermine the weak civilian government of Nobel Peace laureate Aung San Suu Kyi, which took office last year, ending five decades of ruinous army rule. The military remains politically powerful and oversees security operations. Bangladesh border guards said on Sunday the flow of refugees leaving Myanmar had eased off over the past day, apparently because bad weather had discouraged people from taking to boats to reach Bangladesh.